Physiology is the study of how the body works. This includes the study of whole organism and its responses to various physiological, pathophysiological and environmental conditions, the working of individual organs and also includes the processes that take place in single cells. 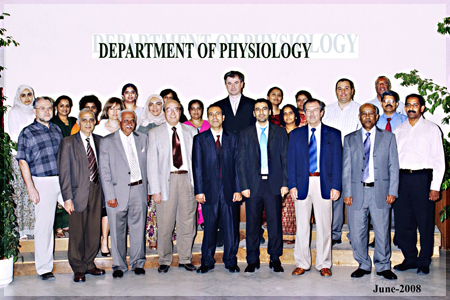 The Department of Physiology is part of the Faculty of Medicine and it is one of the largest basic sciences departments with 15 academic staff, 6 support academic staff, 11 technical staff and large number of graduate students (15-20). A part of the Department of Physiology is the Biomedical Engineering unit with 3 academic staff members and one support staff. Faculty members of the Department of Physiology maintain active research programs covering a wide range of topics with emphasis on cardiovascular physiology, neurosciences, molecular endocrinology & reproduction, exercise physiology, nutrition and renal physiology as well as on the use of stem cells in high throughput studies and biological imaging.